Archive by category "Self Development"
Recently I’ve been rethinking how I feel about work and jobs. As you may or may not know, I help business owners solve technology and marketing problems, which gives me some freedom to choose who I work with and when. I don’t have fixed hours and if I work more, I can get paid more, but it’s not all roses and cherry blossoms. When you run your own business, while you may earn more, much of your work is doubled or even tripled. Not only do you have to do the work, but you have to go earn it, and then process all the finances, documentation, and taxes on the back end. In a traditional job environment the work is handed to you and you just do it. When it’s done, someone else processes it. Your work is finite and so is your pay. For ten years I worked full time jobs in banking and technology, and I always would told myself I’d be happier running my own business until one day I did. I started off running it on the side in 2007 and in 2011 I finally went full time. I do web design with HTML, CSS, and WordPress, email support with web hosts and Google Apps, and computer and network support for Microsoft products like Windows and Server 2003/2008. While I have been successful at running my own business, there are two reasons why I’ve recently began applying for jobs in the Indianapolis market. The first reason is because I realized that the ideas I had about working hard now in order to do much less later were not realistic. I didn’t even realize I had this mentality until after a couple of months had gone by and I discovered that there will never be a time when I’m doing ‘nothing’. I’ll always be doing something, so why not just spend some time figuring out what I want to do, not just what I can find a job doing. The second reason I began looking for jobs in the Indianapolis area was because I realized that it didn’t matter who I was doing the work for, as long as I was enjoying what I was doing. Even as a business owner, I have a boss. I have clients, my wife, and my Lord to report to. It’s not just willy nilly around here. I have to meet or exceed all of their expectations just as I would have to in a traditional job scenario – only more so because while the rewards are higher, so are the risks. There are no written warnings with clients, just lost opportunities in the future. A friend of mine, Jason Cobb, recently coined a term, “You are a startup,” meaning that whatever you’re doing, do it like a startup. But what is a startup? A startup is traditionally a software company that is rapidly trying to create a product that is useful and monetizeable as fast as they can. It normally involves a small team consisting of a leader, a technical co-founder, and a marketer. These roles could all be one person, or it could be five people, but the point is that it’s a small team pushing out useful iterations of a product with the hopes of expanding very fast once a market can’t live without it. 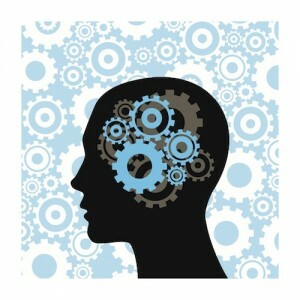 So how does a startup mentality apply to you? Whether you are working for a client or for a company as an employee, you must be producing stuff that matters, you must be a leader, and you must be marketing yourself. This means listening to your customers and getting feedback, getting to know your fellow employees, and continuing your education (via meetups, books, or traditional training). As I wrote about in 13 More Books for Every Entrepreneur, Reid Hoffman, (co-founder of LinkedIn) together with Ben Casnocha (entrepreneur and author) have written a book about managing your career as if it were a start-up business: a living, breathing, growing start-up of you. The thesis is that the same skills startup entrepreneurs use, professionals need to get ahead today. Now that I’ve experienced running my own business, I no longer look down on the traditional 9-to-5 job because I know that I can have impact either way and still accomplish my goals of learning, growing, and taking care of my family. I recently subscribed to a blog I’ve been reading since 2008 called I Will Teach You to Be Rich by Ramit Sethi. Today he sent out a link to a PDF with a 12 Month Goals Roadmap worksheet, very similar to Michael Hyatt’s Life Plan. I’d like to share my answers here. 3. Where will you be working? – The Greater Indianapolis area, preferably along US 31, Keystone Ave, or 465; In an office with time allocated to work in blocks without interruption, the ability to get up and walk around or go outside for a walk; And good Mexican, Chinese, and Thai food nearby. 4. How much time do you spend working? – 10 hours a day, 70 hours a week. 5. What does your Monday look like? – Reading and sharing emails until noon, viewing reports, and responding to client requests. If anyone is interested in using my services or would just like to get together for coffee, please don’t hesitate to email me or follow me on Twitter. This is one of those personal blog posts, if you’re interested in reading more about me specifically, try this one next or not, it’s your life. 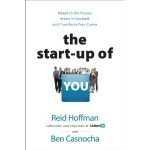 The Start-Up of You: Adapt to the Future, Invest in Yourself, and Transform Your Career by Reid Hoffman and Ben Casnocha. Reid Hoffman, (entrepreneur, investor, and co-founder of LinkedIn) together with Ben Casnocha (entrepreneur and author) have created a revolutionary new blueprint for thriving in today’s fractured world of work. Traditional job security is a thing of the past. Hoffman and Casnocha show how to accelerate your career in today’s competitive world by managing your career as if it were a start-up business: a living, breathing, growing start-up of you. The same skills startup entrepreneurs use, professionals need to get ahead today. This book isn’t about cover letters or resumes. Instead, you will learn the best practices of Silicon Valley start-ups, and how to apply these entrepreneurial strategies to your career. Whether you work for a giant multinational corporation, a small local business, or launching your own venture. Eric Ries, entrepreneur and author of the popular blog Startup Lessons Learned, co-founded and served as CTO of IMVU, his third startup, and has had plenty of startup experience along the way. The Lean Startup is a new approach to starting a business that is changing the way companies are built and new products are launched. Ries defines a startup as, “An organization dedicated to creating something new under conditions of extreme uncertainty.” This is just as true for one-person company to a group of seasoned professionals in a Fortune 500 boardroom. The mission is to discover a repeatable, successful path to a sustainable business. 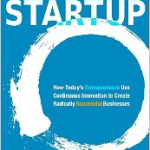 The Lean Startup approach encourages companies to leverage human creativity more effectively. Inspired by lessons from lean manufacturing, it relies on “validated learning,” rapid scientific experimentation, and a number of counter-intuitive practices that shorten product development cycles, measure actual progress with significant metrics, and learn what customers really want. It’s what makes a company agile, regardless of it’s size, by altering plans inch by inch and minute by minute. Businesses are asked to test their vision continuously, adapt, pivot, and adjust – before it’s too late. 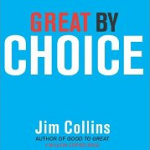 Jim Collins (student, teacher, and author) and Morten T. Hansen (a management professor at University of California) have teamed up to write Great by Choice, which asks, “Why do some companies thrive in uncertainty, even chaos, and others do not?” Based on nine years of research, buttressed by rigorous analysis and infused with engaging stories, Collins and Hansen, explain the key principles for building a great company in unpredictable, tumultuous, and fast-moving times. As with Collin’s prior work, he uses a team of researchers to study companies that rose to greatness by beating their industry indexes by a minimum of ten times over fifteen years. That would be a feat in and of itself, but these businesses also had to do it in environments that experienced rapid shifts that leaders could not predict or control and other extreme environments. The best leaders were not more risk taking, more visionary, and more creative than the comparisons; they were more disciplined, more empirical, and more paranoid. Another surprise: Innovation is not as important as the ability to scale innovation and to blend creativity with discipline. Contrasting to Ries’ agile movement, Great by Choice states that, “Leading in a ‘fast world’ always requires ‘fast decisions’ and ‘fast action’ is a good way to get killed.” The great companies, Collins and Hansen argue, changed less in reaction to a radically changing world than the comparison companies. John Hamm, author and leadership expert, explains why leadership can’t be mastered as a single concept or tool. Instead, excellent leadership is composed of actions, ideas, emotions, cultural forces, history, and expectations that work together in an interconnected system. This system forms the core of the winning combination of superb character, skill-based competence, and professional reputation. Hamm demonstrates that any leader can excel by consistently putting into action the Necessary Nine skills: being authentic, trustworthy, and compelling; leading people, strategy, and execution; communicating, making decisions, and making an impact. 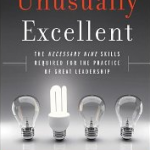 Unusually Excellent offers powerful, unforgettable leadership lessons, reinforced empirical evidence, and logical analysis. Treat it like your personal coach – one that will prepare you for the lifelong and ongoing journey towards exceptional leadership. 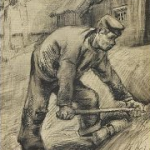 Steven Pressfield, author of The Legend of Bagger Vance, Gates of Fire, and The War of Art, asks, “What is this terrible thing called Resistance — and how can I overcome it?” Do the Work probes further, “Could you be getting in your way of producing great work? Have you started a project but never finished? Would you like to do work that matters, but don’t know where to start?” The answer is to do the work. It’s not about better ideas, it’s about actually doing the work. Do the Work is a weapon against Resistance – a tool that will help you take action and successfully ship projects out the door. “There is an enemy. There is an intelligent, active, malign force working against us. Step one is to recognize this. This recognition alone is enormously powerful. It saved my life, and it will save yours.” When I used to be in Amway, I used to ask how to make money. The response was, “Show the plan.” When I’d ask how to show the plan, the response was the same, “Show the plan.” Sometimes you just have to do the work. Read this when you’re feeling resistance. I did. 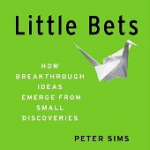 Peter Sims, author, speaker, and entrepreneur, found that successful people in different industries achieved breakthrough results by methodically taking small, experimental steps in order to discover and develop new ideas. Rather than believing they have to start with a big idea or plan a whole project out in advance, trying to foresee the final outcome, they make a series of little bets about what might be a good direction, learning from lots of little failures and from small but highly significant wins that allow them to happen upon unexpected avenues and arrive at extraordinary outcomes. This is similar to Ries’ agile method in The Lean Startup. Based on extensive research, including more than 200 interviews with leading innovators, Sims discovered that productive, creative thinkers and doers (Do the Work) from Ludwig van Beethoven to Thomas Edison and Amazon’s Jeff Bezos practice a key set of simple but ingenious methods. Fail quickly to learn fast, tap into the genius of play, and engage in highly immersed observation to free minds, opening them up to making unexpected connections and perceiving invaluable insights. These methods also unshackle them from the constraints of overly analytical thinking and linear problem solving that our education places so much emphasis on, as well as from the fear of failure, all of which thwart so many of us in trying to be more innovative. Duncan J. Watts, a professor of sociology at Columbia University, a principal research scientist at Yahoo! Research, and a former officer in the Royal Australian Navy, holds a Ph.D. in Theoretical and Applied Mechanics from Cornell University. He is the author of Six Degrees: The Science of a Connected Age and in Everything Is Obvious he asks, “Why is the Mona Lisa the most famous painting in the world? Why did Facebook succeed when other social networking sites failed? Did the surge in Iraq really lead to less violence? How much can CEO’s impact the performance of their companies? And does higher pay incentivize people to work hard?” If you think the answers to these questions are a matter of common sense, think again. 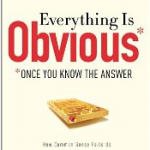 As Watts explains in this book, the obvious explanations we give for life’s outcomes are less useful than they seem. Drawing on the latest scientific research, along with a wealth of historical and contemporary examples, Watts shows how common sense reasoning and history conspire to mislead us into believing that we understand more about the world of human behavior than we do; and in turn, why attempts to predict, manage, or manipulate social and economic systems so often go awry. Jeff Dyer (Professor of Strategy at the Marriott School, BYU), Clayton M. Christensen (Robert and Jane Cizik Professor of Business Administration at the Harvard Business School, co-founder of Innosight, a management consultancy; Rose Park Advisors, an investment firm; and Innosight Institute, a non-profit think tank), and Hal B Gregersen, (Professor of Leadership at Insead; a co-founder of The Innovator’s DNA, a leadership consultancy; and a Senior Fellow at Innosight, a management consultancy) wrote The Innovator’s DNA: Mastering the Five Skills of Disruptive Innovators. The book proposes that you could be innovative and impactful if you can change your behaviors to improve your creative impact. 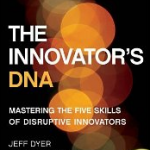 By identifying behaviors of the world’s best innovators—from leaders at Amazon and Apple to those at Google, Skype, and Virgin Group—the authors outline five discovery skills that distinguish innovative entrepreneurs and executives from ordinary managers: Associating, Questioning, Observing, Networking, and Experimenting. The authors state that once you master the core competencies (ability to generate ideas, collaborate with colleagues to implement them, and build innovation skills throughout your organization to sharpen its competitive edge) innovation advantage can translate into a premium in your company’s stock price—an innovation premium—which is possible only by building the code for innovation right into your organization’s people, processes, and guiding philosophies. Malcolm Gladwell, a staff writer with The New Yorker magazine since 1996. His 1999 profile of Ron Popeil won a National Magazine Award, and in 2005 he was named one of Time Magazine’s 100 Most Influential People. He is the author of The Tipping Point: How Little Things Make a Big Difference and Blink: The Power of Thinking Without Thinking, both of which were number one New York Times bestsellers. 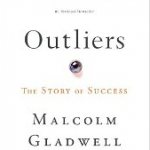 In this stunning new book, Outliers, Malcolm Gladwell takes us on an intellectual journey through the world of the best and the brightest, the most famous, and the most successful people. Gladwell asks the question, “What makes high-achievers different?” His answer is that we pay too much attention to what successful people are like, and too little attention to where they are from: that is, their culture, their family, their generation, and the idiosyncratic experiences of their upbringing. Along the way he explains the secrets of software billionaires, what it takes to be a great soccer player, why Asians are good at math, and what made the Beatles the greatest rock band. 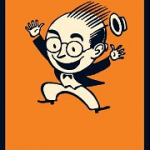 Seth Godin is the author of ten international bestsellers that have been translated into over 30 languages, and have changed the way people think about marketing and work. His Unleashing the Ideavirus is the most popular ebook ever published, and Purple Cow is the bestselling marketing book of the decade. If you’re stuck at the starting line, you don’t need more time or permission, to wait for your boss’s okay, or to be told to push the button; you just need to poke. Poke the Box is a call to action about the initiative you’re taking-–in your job or in your life. Godin knows that one of our scarcest resources is the spark of initiative in most organizations (and most careers)-–the person with the guts to say, “I want to start stuff.” Poke the Box just may be the kick in the pants you need to shake up your life. Derek Sivers, entrepreneur, programmer, avid student of life, went looking for ways to sell his own CD online and ended up creating CD Baby, once the largest seller of independent music on the web with over $100M in sales for over 150,000 musician clients. 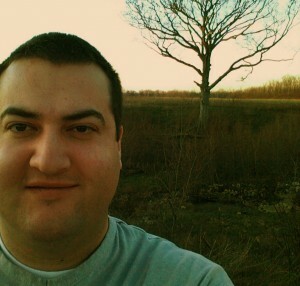 Since 2008, Derek has traveled the world and stayed busy creating and nurturing creative endeavors, like Muckwork, his newest company where teams of efficient assistants help musicians do their “uncreative dirty work.” Derek writes regularly on creativity, entrepreneurship, and music on his blog. In Anything You Want, Derek Sivers chronicles his “accidental” success and failures into this concise and inspiring book on how to create a multi-million dollar company by following your passion. In this book, Sivers details his journey and the lessons learned along the way of creating CD Baby and building a business close to his heart. “[Sivers is] one of the last music-business folk heroes,” says Esquire magazine. His less-scripted approach to business is refreshing and will educate readers to feel empowered to follow their own dreams. Aspiring entrepreneurs and others trying to make their own way will be particularly comforted by Sivers straight talk and transparency -a reminder that anything you want is within your reach. Josh Kaufman, an independent business teacher, education activist, and author, brings a multidisciplinary approach to business education that has helped hundreds of thousands of readers around the world master foundational business concepts on their own terms. His work has been featured in BusinessWeek, Fortune, and Fast Company, as well as by influential websites like Lifehacker, HarvardBusiness.org, Cool Tools, and Seth Godin’s Blog. Getting an MBA is an expensive choice-one almost impossible to justify regardless of the state of the economy. Even the elite schools like Harvard and Wharton offer outdated, assembly-line programs that teach you more about PowerPoint presentations and unnecessary financial models than what it takes to run a real business. You can get better results (and save hundreds of thousands of dollars) by skipping business school altogether. Learn the essentials of entrepreneurship, marketing, sales, negotiation, operations, productivity, systems design, and much more, in one comprehensive volume. 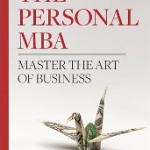 The Personal MBA distills the most valuable business lessons into simple, memorable mental models that can be applied to real-world challenges. Ken Robinson (an internationally recognized leader in the development of creativity, innovation and human resources) and Lou Aronica (author). Robinson has worked with national governments in Europe and Asia, international agencies, Fortune 500 companies, national and state education systems, non-profit organizations and some of the world’s leading cultural organizations. He was knighted in 2003 for his contribution to education and the arts. The Element is the point at which natural talent meets personal passion. When people arrive at the Element, they feel most like themselves, most inspired, and achieve at their highest levels. With a wry sense of humor, Ken Robinson looks at the conditions that enable us to find ourselves in the Element and those that stifle that possibility. Drawing on the stories of a wide range of people, including Paul McCartney, Matt Groening, Richard Branson, Arianna Huffington, and Bart Conner, he shows that age and occupation are no barrier and that this is the essential strategy for transform­ing education, business, and communities in the twenty-first century. 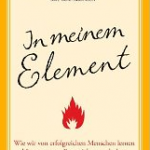 The Element is a breakthrough book about talent, passion, and achievement from one of the world’s leading thinkers on creativity and self-fulfillment. I thought I’d answer these questions Michael Hyatt asked of himself about being overwhelmed and I encourage you to as well. My name is Erich Stauffer and my answers are below the questions. 1. Are you ready for a change? 2. What is it that only I can do? Where do I add the most value? What is really important as opposed to merely urgent? 3. What are your three biggest productivity sinkholes? 4. Record your most common activities and tasks into categorized lists and determine what can be eliminated, automated, or delegated. 5. What do you make an hour (inside and outside of your 8-5 job)? Could you be more financially productive (and a better steward of your time) if you delegated to a paid assistant or service? Have you ever considered a VA? 6. How much of your calendar this week is dedicated to high payoff activities/important tasks? 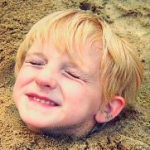 Are you putting the big rocks in your metaphorical jar before putting in the sand and water?